Henry: Yoga was part of a personal healing process; along the way I became fascinated by yoga as a vehicle for social change. Certain thinkers have influenced my yoga service work; for instance, you can view yoga service through the lens and power of voluntary associations as suggested by Alexis de Tocqueville in Democracy in America, and its application in the living culture of your immediate community. There are plenty of like-minded people around that you can collaborate with to make a difference in your community: find the courage to start the community yourself. Is there a standout moment from your work with your community? Yes, it was realizing yoga service nonprofits can be as effective as any private business. Hosh Yoga and Hosh Kids in New York make yoga accessible regardless of skill or income. We have never refused service to any person, school, or parent for lack of financial resources. We build yoga communities by delivering a bold and strong message to all our stakeholders. This does not mean that you can’t build a business that can grow financially solvent and sustainable while developing a brand that is mission- and values-driven. Therefore, the power of our nonprofit story, brand message, and dedicated team can only make our bottom line stronger. You can put good information to action making your organization better. What did you know about the population you are working with before you began teaching? When I became a public school teacher, I knew I wanted to make a difference. I’m sure every classroom teacher and teaching artist can relate. However, it takes much more than just your will to make a difference and change the lives of our school students. I’ve seen too many of my peers and colleagues teaching in very stressful environments as classroom and yoga teachers in schools. I developed and directed a staff development program for an enrichment vendor in NYC with over 50 teachers, and I realized you had to teach teachers about the context of a learning environment before they could effectively deliver content. I’ve visited thousands of classrooms and I rarely meet a teacher who doesn’t understand what he or she is teaching. Teachers teach as they know how. Therefore, the sooner a kids yoga teacher develops an education philosophy and an understanding of human motivation, praise, self-esteem and discipline, the sooner that teacher can deliver content. I’ve shared our message with principals, political leaders, and superintendents, most of whom still know very little about yoga as a health and wellness option in schools. With children it’s difficult to teach life lessons, over and above content. Yoga philosophy is full of guidance in how to live and what to live for that we can help children understand in a simple way. We encourage our staff to understand the context of the learning environment, because children who might need yoga the most are also the ones most divorced from it. I would get a mentor, and I’d volunteer, as ways to learn from others teaching kids yoga in schools. Be ready to ask for help. Be ready to change and question your teaching approach depending on whom you are teaching. The process might be rocky, but there is good news in every classroom if you look for it. Believe that you too can start a program that makes a difference in people’s lives. From a business perspective, visual marketing is a powerful tool to deliver your message, impact, and results in an interactive way. You can make a lot of good happen with limited resources, passion, and skill. Investing time in training your staff to deliver the brand message at every point of contact with your stakeholders is essential. Hosh Kids does it by running Open Book Management, and I credit this method with expanding our reach to over 20 kids’ yoga programs in NYC in 16 months. I would say that if you’re going to volunteer a large amount of time, heart, and effort into a nonprofit, it is also possible to plan and strategize about how to generate an income from it in the long run. 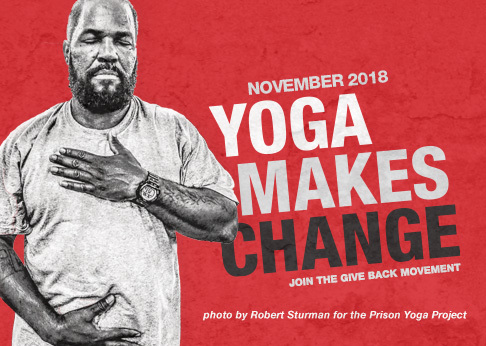 As yoga service nonprofits, we should constantly be advocating for more yoga service programs in the community. I believe yoga is a life skill that works for anyone, anytime, anywhere. I simply share with our leaders that as we teach children how to take tests, we must also teach them life skills that make them better test takers. Go out there and tell the community about yoga service. I hope yoga studios and yoga service nonprofits collaborate more often in joint programming in their communities. We can do things better and on a bigger scale by collaborating than by competing with each other. I believe yoga service is part of the new yoga economy. I hope there will be innovators who help donors look at yoga service as a form of philanthropy that yields great cost savings to our society, making it worthwhile to use private dollars for this awesome public good. I’m confident that the collective effort of the yoga service community will make yoga an increasingly popular form of community service across the country. Are you interested in building strong, engaged and resilient communities? Join us at the fourth annual Yoga Service Conference at Omega Institute on May 14-17, 2015.